Hundreds of traditional and imported remedies on the shelves of health food shops and herbalists are set to be banned under new licensing rules. The EU directive aims to protect users from any damaging side-effects that can arise from taking unsuitable medicines. Only high quality, long-established and scientifically safe herbal medicines will be sold over the counter. Some traders who sell products imported from outside the EU say their business will be hit. Herbal medicines - with names such as Cascara Bark and Horny Goat Weed - have become popular. But from the first of May an EU directive will be enforced, under which all such products must be licensed, following fears that some products could cause harm. Producers and independent health store owners say the directive, passed in 2004, is draconian and skewed in favour of the largest European manufacturers. Selwyn Soe runs The Herbal Factory, a contract manufacturer of herbal remedies in Croydon, south London. He believes smaller firms like his own will be squeezed out altogether. "Unfortunately it looks as if we will have to close down because of this legislation," he said. "The problem for us is that although we would have to pay many thousands of pounds for a licence to keep making each product, unlike a drug company we would not have a licence to make that product exclusively. It just will not be worth paying out the money." The Maple Leaf Pharmacy in Twickenham, west London, specialises in alternative and holistic medicine alongside its conventional chemist business. Owner Galen Rosenberg estimates that about 20% of the health products sold in his pharmacy will simply vanish off the shelves. 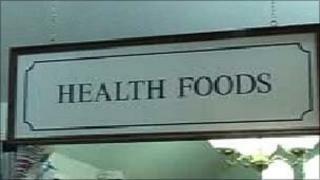 In some health food shops a far larger percentage of existing lines are likely to be outlawed. Mr Rosenberg said he welcomed improved labelling, indicating side-effects, but said the rest of the directive was over the top. "For instance, we have something which we recommend for hot flushes during menopause. The results have been excellent, but from April I will not be able to order these products in, because the producing company is not large and will not be able to afford the hundreds of thousands of pounds needed to invest for the new regulations," he said. "The new rules are very much in favour of large companies. It is the loss of freedom of choice which worries me. We also expect massive price increases because of the cost of compliance." However, the regulator of all these pills and potions says the aim is to protect consumers, not to pick off small suppliers. Richard Woodfield, of the Medicines and Healthcare Products Regulatory Agency, also rejects any suggestions that the legislation is draconian. "What regulation does is to ensure products meet assured standards. Although the standards are challenging, they are achievable and manageable," he said. "We already have 24 different companies regulating under the scheme and they are certainly not all large companies." Yet a leading medicines specialist says he fears the consumer may not be much wiser come May this year. Professor David Colquhoun, professor of pharmacology at University College London, said the changes were of limited value because the rules did not require makers to show any evidence of whether the newly licensed products were effective. There are fears that people determined to keep taking their favourite herbs may go online and choose to buy them from merchants who may be careless about quality or potency. The EU insists that in future, only high quality, long established and scientifically safe herbal medicines can be sold over the counter. But the label still will not be able to tell customers if they can be shown to work.